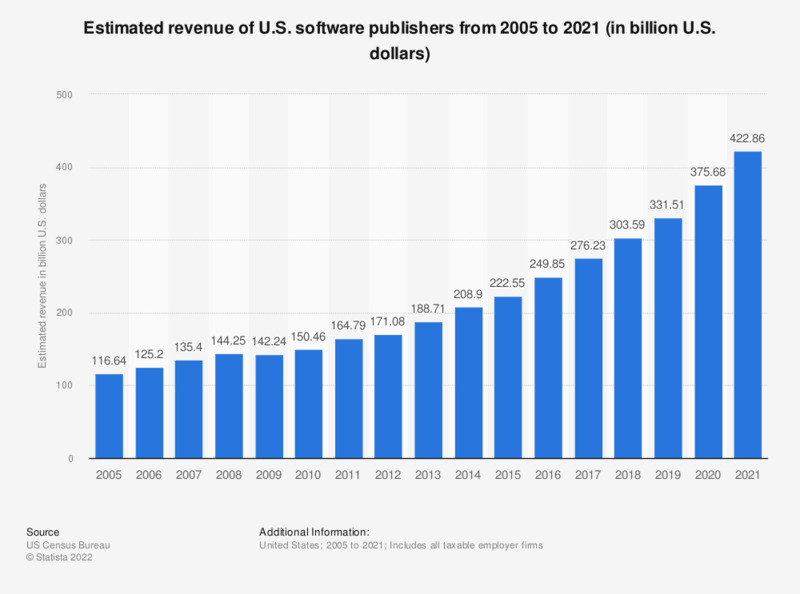 The statistic above presents estimates of the annual aggregate revenue of the U.S. software publishing industry from 2005 to 2018. In 2018, U.S. software publishers generated an estimated total revenue of 257.94 billion U.S. dollars. Presented figures have been calculated by adding up quarterly figures. This industry group comprises establishments primarily engaged in computer software publishing or publishing and reproduction. Establishments in this industry carry out operations necessary for producing and distributing computer software, such as designing, providing documentation, assisting in installation, and providing support services to software purchasers. These establishments may design, develop, and publish, or publish only.